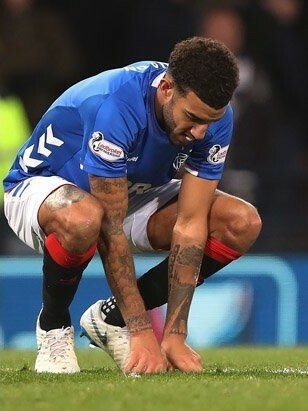 Ibrox Noise: What on earth has happened to Connor Goldson? What on earth has happened to Connor Goldson? We admit here at Ibrox Noise that we’d been advocating a break for the-then out-of-form Connor Goldson going back a couple of months. He had, however, picked up performances again, seemingly assisted by the experience of Gareth McAuley next to him. However, that injury sustained against Hibernian and his absence from training most of this calendar year (not to mentioned both fixtures) does bring into question the decision to select him against Celtic and the cost that may have entailed. Gerrard has been pretty vague about Goldson’s status – we’re not even totally clear on his exact injury apart from some kind of bad knock which even assistant Gary McAllister was a little cloudy on, but it’s been serious enough to keep him away from both the squads and training sessions. And it is evident in the two matches of his absence Rangers shipping four goals gives some idea of how badly Goldson is currently being missed. He is not the world’s best defender, but his performances latterly last year were showing signs of regaining form and back to the early season CB the £3M looked well-spent on. But that injury v Hibs really has curtailed him, and right now Rangers do not have a defence we can trust. And four goals conceded against two fairly potent teams is a deep concern given we face another in Gary Holt’s Livi without Goldson’s services to rely on. It’s a worry, and with Joe Worrall suddenly the scapegoat at the back (for right or wrong) we must say we’re not feeling confident about the rear this weekend. As usual we will turn at 2-3 week absence into a two month one. Then there will be the customary 2-3 week period when he is fit when we won't want to rush him back. That's a month gone and still no sign of a comeback.